The other day, Malky Hughes, a Twitter follower of mine, sent me a link to a 3-minute Youtube video that fascinated me. Produced in 1901, this short, simply titled Jamaica Street, Glasgow, is a documentary-style movie in which a camera, set up on the side of the road, captures people going about their daily business, traveling along what must have been the busiest street in all of Scotland (you can check it out by clicking here). After watching this brief film, I started wondering if somewhere in my large collection of DVDs and Blu-Rays I had similar shorts, just waiting to be discovered. Sure enough, I did; part of the More Treasures from the American Archives collection, The Streets of New York presents a trio of movies, each shot in the opening days of the 20th Century, that act as a window into the past, allowing modern viewers to step back in time and experience a slice of life from an era long gone. The oldest of the three, What Happened on Twenty Third Street, New York City (1901) was produced by the Edison Company and directed by Edwin Porter (The Great Train Robbery). Focusing our attention down the street, we watch passersby travel from one end to the other, unaware that two Edison employees (A.C. Abadie and Florence Georgie) were about to stage a joke sure to bring a smile to the faces of all the lucky gentlemen who happened to be walking by (think Marilyn Monroe and the subway grate in 1955’s The Seven Year Itch). Next up is At the Foot of the Flatiron, also shot along 23rd street near what, at the time, was the largest skyscraper in New York (nicknamed the Flatiron for its triangular shape). Produced by the Biograph Company in 1903 on a very windy Autumn day, we watch as dozens of men and women stroll hurriedly past, all holding onto their hats out of fear of losing them (one unfortunate guy should have held his a bit tighter). Finishing things off is 1903’s New York City “Ghetto” Fish Market, for which Edison sent a cameraman to a Jewish neighborhood to capture fish vendors selling their wares. Shot a few floors above the action, this is the only film where the camera moves (panning right to left), which obviously caught the attention of a few people on ground level (one guy, right at the end, thumbs his nose defiantly at the audience). These three motion pictures are well over a hundred years old, featuring men, women, and even children who have long since shuffled off this mortal coil (anyone born the day they were made would be at least 111 right now). Most of us think of movies as a form of entertainment, while some appreciate their artistic merits. But films like these serve an even greater purpose, forever preserving a moment in time (moments that, admittedly, wouldn’t have mattered much had there not been a motion picture camera present to capture them) and allowing us to experience what those who went before us experienced. 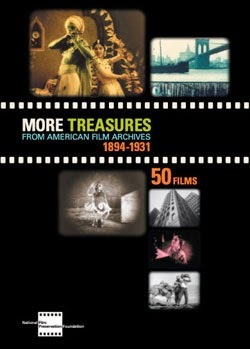 Film is, indeed, a great art form and a very entertaining medium, but it’s also an invaluable tool for historians. Thanks to the movies in The Streets of New York, as well as Jamaica Street, Glasgow, the mysteries of the past are now a little less mysterious.